CROSBY  The Crosby-Huffman Chamber of Commerce hosted their annual Picnic in the Park last Thursday with an invitation to Precinct 2 to speak. It was learned shortly that the Chamber has many concerns about infrastructure and taxes. The picnic saw Don Cox and Bob Ward flip the best burgers in the greater unincorporated area, donated by Arlens Grocery. Community Resource Credit Union got everyones approval with rootbeer floats and Alliance Properties dished up the food. Jeremy Phillips spoke for Precinct 2 Commissioner Jack Morman at the picnic and conveyed the bare facts of the bond referendum to be on the Nov. 3, 2015 ballot. Harris County Commissioners Court passed four propositions on July 28. The first issue is $700 M for road improvements. About $60 M would be for subdivision street replacement and repair. A tax would be levied to pay for the bonds. The second proposition is for issuance of $60 M for parks in the county. The third proposition calls for $24M to veterinary public health adoption and care centers and the associated tax increase. The fourth and final proposition is for $64 M for the county flood control district and increase of taxes. During introductions the crowd learned that Phillips is a graduate of West Point and an Army veteran of the War on Terror in Afghanistan in leaving in less than a year in 2005. Eastside Veterans host a Coushatta Bus Trip on Oct. 6 reserved for the first 50 people that sign up. The bus leaves at 7:30 a.m. that Tuesday. Cost is $10 per person and those that would go should contact Don Guillory at 713-819-5976. This year they are raffling off an AR 15, a Henry lever action 30-30 rifle and a small, concealable pistol with laser sight. Those interested can call Bob Ward at (832) 527-1550. Phillips highlighted the massive undertaking done at both Highlands and Crosby parks. Two playground structures plus concrete barriers, sidewalks and park enhancement ran nearly $600,000 for Highlands and Crosby. The playground hyper-modern Jungle Jim kids play feature in Crosby Park cost $220,000 and the one in Highlands cost $353, 000. Some attendees of the picnic say one could fall on these structures and not get hurt. Construction will begin in the Deer Park area in a couple of weeks for a similar play feature there. Construction on the TxDOT bridge to connect with the countys efforts in Barrett Station roadway work for viability will hold pre-construction meetings this week to finalize details of how the task will be completed. This would be adding new bridgework to widen the bayou overpass from US 90 south to FM 1942. CROSBY  Although it has yet to be used, a flight-path to helipad has been put into service here last Saturday, Sept. 12 behind Crosby Volunteer Fire Station #1 on US 90 just after it was finalized. The helipad is important especially to this area because frequently previously, requests by ambulance crews for helicopter air lifts by Life Flight had to be turned down due to low visibility. Dayton, Liberty, Crosby and Huffman lack radar weather stations to give them a complete picture. Typically they either are grounded because of a low ceiling or make attempts and turn back because the low fog bank near FM 1942 hits abruptly. The theory is the cool canopy line from the trees and moist grass farms mix with the warm air of the bay in Baytown causing this to be a routine weather pattern in the district especially in fall and spring. The Life Flight system estimates they will get 60% of the turned down flight back with this GPS sight because they can land in 1/4 mile viability and a 300 foot ceiling. The new Flight Path gives a GPS take off to landing at the heliport instrument guidance. The entire system goes back to a conversation between Christy Graves Coordinator of Emergency Medical Services and Jeff Cobb a Life Flight Paramedic for Hermann Memorial at the Texas State EMS Conference a few years ago. Graves had been turned down for 9 much needed Ambulance flights in 4 months. They were networking to determine how to handle the problem of poor weather detection systems in the area. 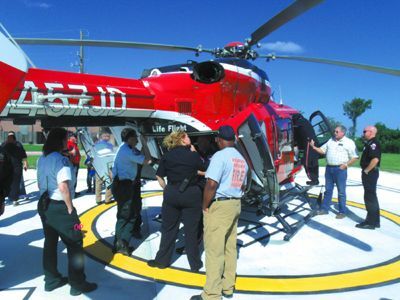 Other EMS providers nearby may also use the helipad that is owned by the taxpayers of Crosby through the two Emergency Service district tax entities. Graves opened with a prayer. Two Lifeflight calls in clear conditions were called into Crosby within an hour the night before landing at different locations than the helipad. One on the night before two locations one on FM 2100 and one on US 90 requred Life Flight Helicopters in good weather conditions. Had there been gale force winds or fog the helipad would have been used. HOUSTON  The jury that found Kelly Jo Ivey guilty of the death of deputy Jesse Valdez last Thursday, on Friday decided on her sentence. They voted to incarcerate her for 60 years. She will not be eligible for parole for at least 30 years. Last October 29, 2014 the deputy was killed in a head on collision on East Wallisville Road, and the trial for the defendant Kelly Jo Ivey, began Monday, Sep. 7 of this year. Last Thursday, she was found guilty of intoxication manslaughter in the death if Deputy Jesse Valdez III in the 2014 car crash. Jesse Valdez was traveling eastbound when a westbound Ivey’s SUV crossed into the deputy’s lane of traffic and struck his patrol car. Valdez’s car spun counter-clockwise into a roadside drainage ditch, and Ivey’s SUV spun into the center of the intersection. Highlands Volunteer Fire Department & EMS cut the 32-year-old deputy from the crushed vehicle and airlifted him to Memorial Hermann Trauma Center, where he was later pronounced dead. The new HCSO Substation in Highlands was named for Valdez, the 40th Harris County Sheriff’s Office employee to die in the line of duty. Ivey was taken to Memorial Hermann Hospital for treatment. A male passenger in the SUV was treated at the crash site. Ivey was charged with intoxication manslaughter of a peace officer and possession of a controlled substance methamphetamine. It was not the first time she was accused in a drug-related crime. Authorities say she was released from Texas prison earlier that month after serving part of a two-year sentence on a previous methamphetamine case. In March 2014, Ivey pleaded guilty to possession of a controlled substance and agreed to the two-year sentence, according to court records. 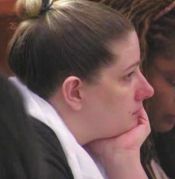 She was released on parole on Oct. 2. Ivey also served time behind bars in two theft cases, according to court records. CROSBY  When parents put their kids on a bus they expect that the utmost protection is being given to their safekeeping. 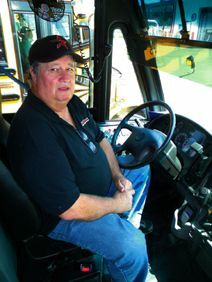 David Cook is a bus driver doing what he can to keep children on his bus safe. He also is often the flag man at Battleground Speedway in Highlands and locally volunteers to help out with good causes. On Sept. 1, according to Cook, a neighborhood woman ran screaming up to Crosby ISD Bus 74 on Port O Call, he figured it was a parent fretting about a child that was on another bus and asking if Cook would phone it in to dispatch and find the child. This happens periodically, especially early in the school year. The parent of the rider volunteered to grab the womans feet so Dave could get her off of the bus. Daves concern was even if the ploy worked, how would he get back on the bus without the woman being able to get back on the bus. He then enlisted the help of a student telling him to flip a switch and shut the door if given the signal.